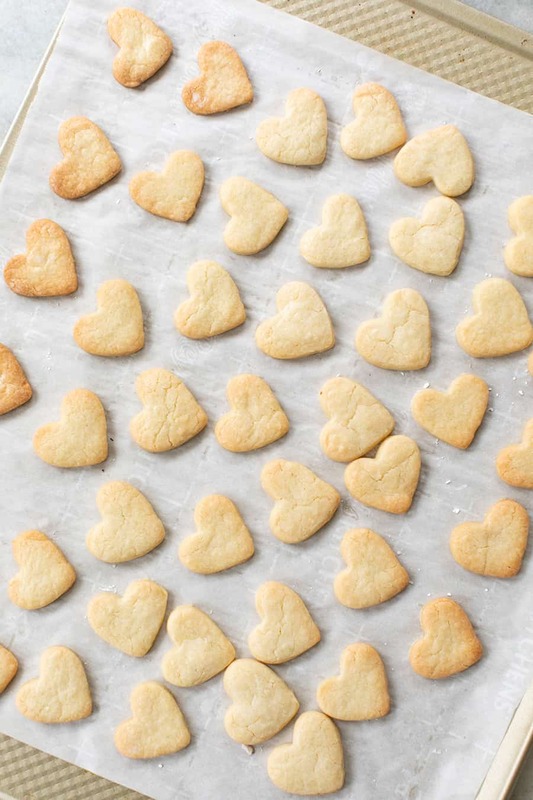 This is the perfect recipe for cut out sugar cookies. 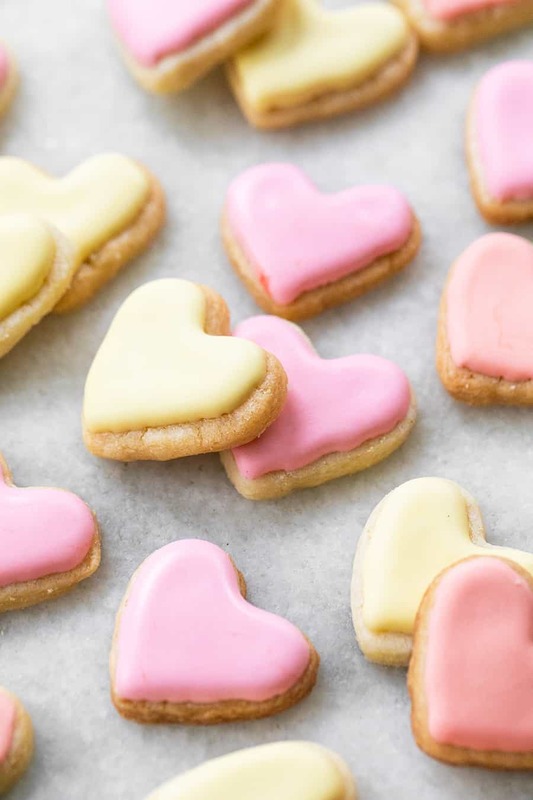 These adorable mini heart-shaped sugar cookies are easy to make, super buttery and keep their shape after baking. 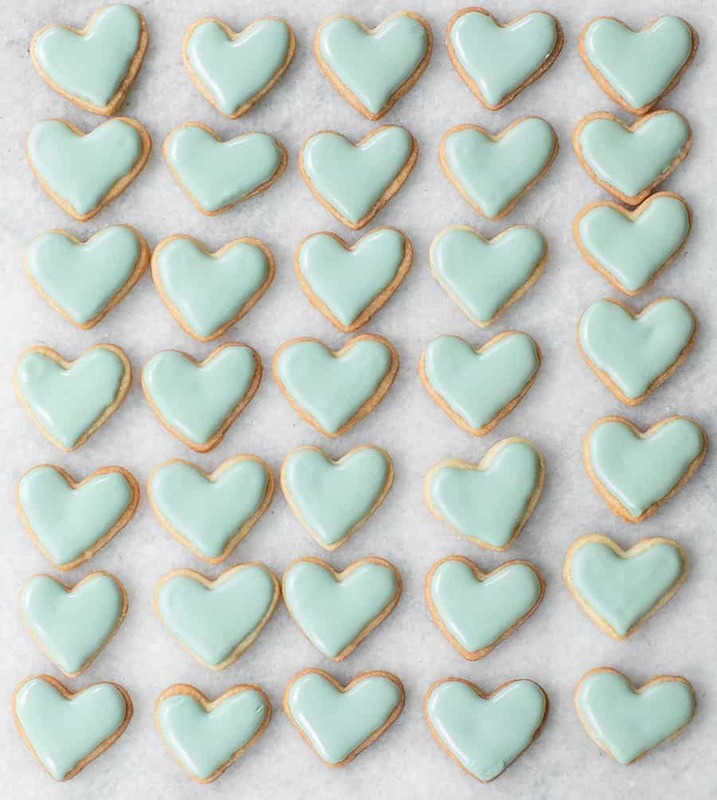 Also, an easy recipe for royal icing to frost these delicious hearts! 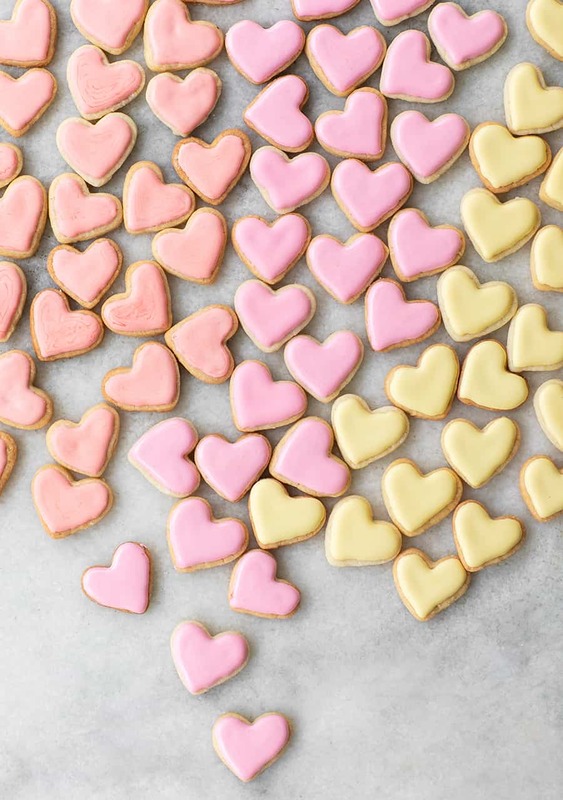 These mini heart-shaped sugar cookies are the most adorable treat for Valentine’s Day or any other day you want to nibble on some sweet treats. Full disclosure, my kids ate most of them and couldn’t stop on the day we baked them. They’re bite size, so once you eat one, you’ll want another and another! 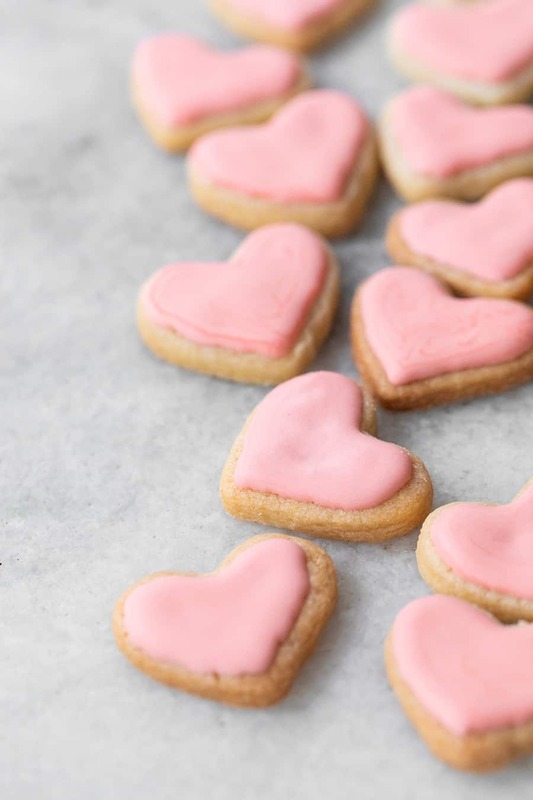 This sugar cookie recipe is my favorite cut out sugar cookie recipe since the cookies are buttery, with the perfect snap, when you bite into them. 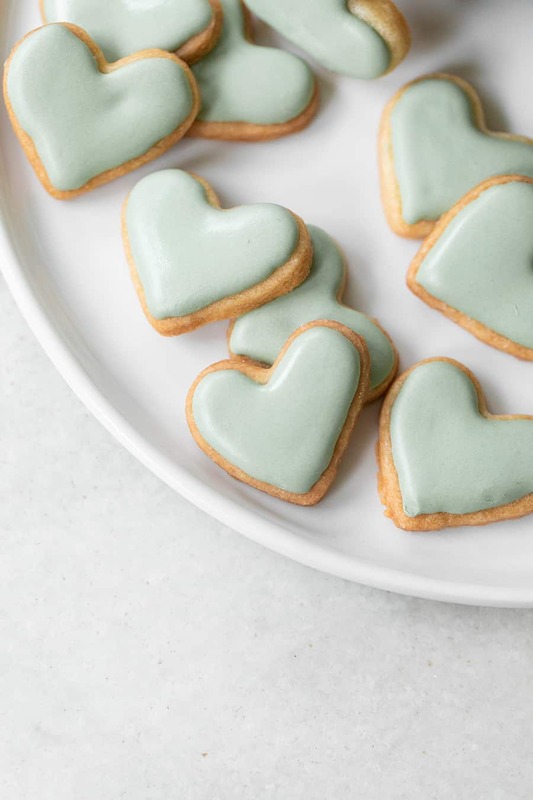 They’re topped with a simple sugar cookie royal icing recipe that blends easily when frosted on top. 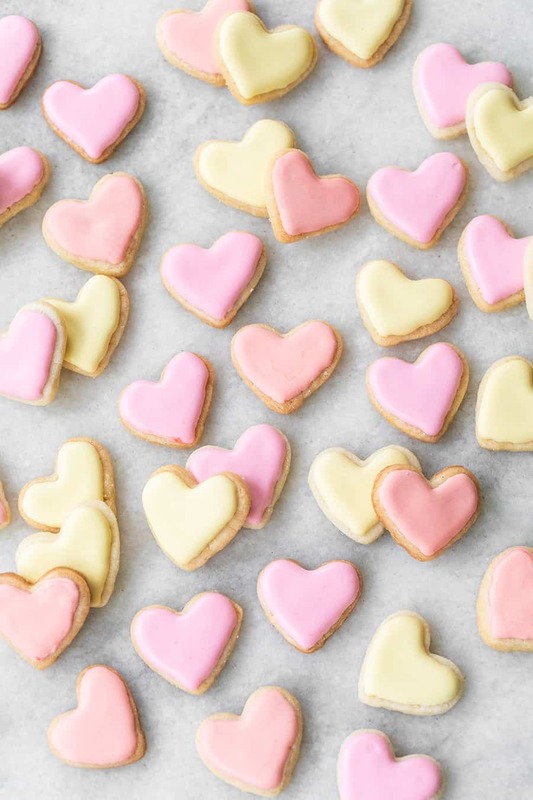 To make these cute little heart-shaped sugar cookies, you’ll need a 1″ heart-shaped cookie cutter, piping bag, food dye in the color you want to use, rolling pin, cookie sheets, parchment paper and all of the ingredients in the recipe below. Follow the recipe, then roll the dough into a ball and refrigerate for 30 minutes. Roll and cut out the shapes to place on a cookie sheet. Sugar cookie dough works better when it’s cold, but not so cold that it’s impossible to roll out. Right after the dough is made, roll it into a ball and refrigerate it for 30 minutes. Then, roll the dough out. The shapes will come out cleaner and easier to lift up to put on the cookie sheet. The cookies bake quickly, so keep an eye on them! They really only need about 7 minutes until they’re golden brown. Of course, everyone’s oven bakes differently, so watch them closely. 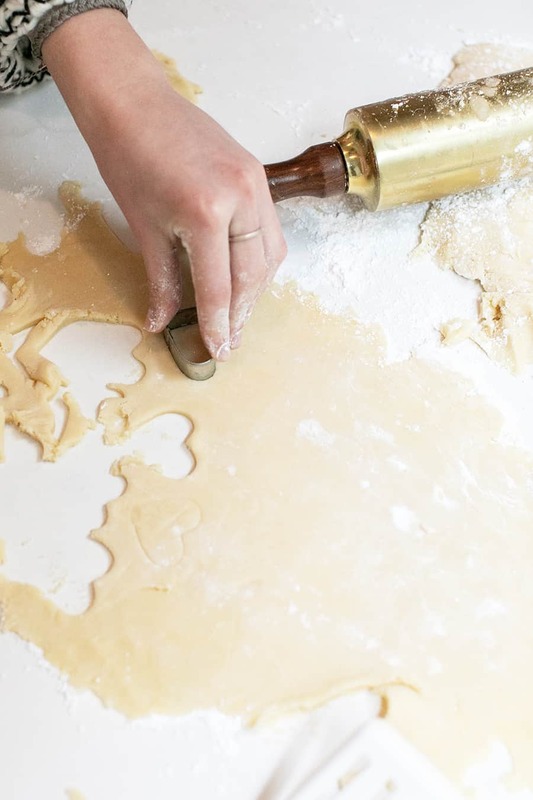 The recipe we use for the sugar cookie icing only has three ingredients… so easy! The hard part is getting to know the right consistency of the frosting. The frosting has to be thick enough to stay on the cookie, but light enough to mold into the shape and become smooth. Usually the ratio in the recipe below works well, but add a little more water if it’s too thick. A little water goes a long way! Frosting sugar cookies can be intimidating, but if you have just a few tools, it’s easy to do! 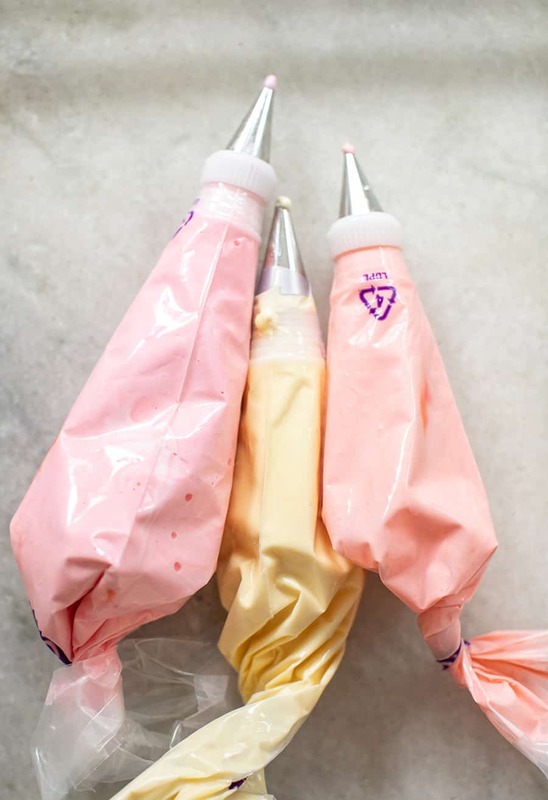 You’ll need a piping bag, a small round tip (Wilton 1 or 2), meringue powder, which is an egg white substitute, and then some gel food colorings. 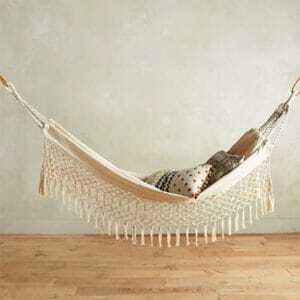 If you want to use natural dye that will totally work as well! 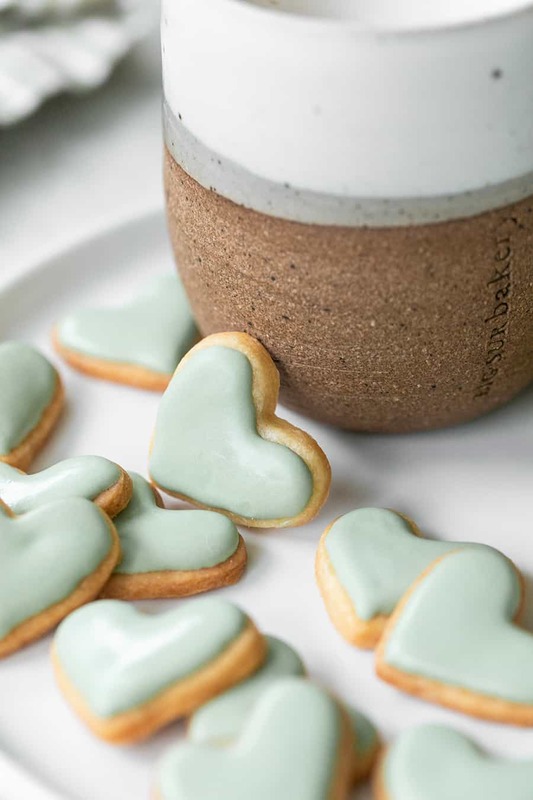 These items will help you frost perfect little heart-shaped cookies! A quick tip for putting frosting in the piping bag – get a large glass, add the bag inside and fold the edges of the bag around the glass. Then spoon in the frosting. It’s mess free! My sweet friend Mara taught me that one! Another quick tip when rolling out sugar cookie dough is to use powdered sugar on the surface and the rolling pin, not flour. 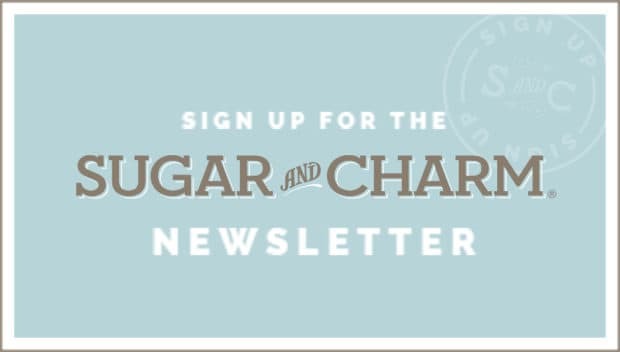 Flour will make the cookies tougher, but the sugar just makes them a little sweeter! It really helps a lot not adding more flour to the dough and the powdered sugar keeps the stickiness down. And I just had to make a Sugar and Charm blue heart! I love that color so much. 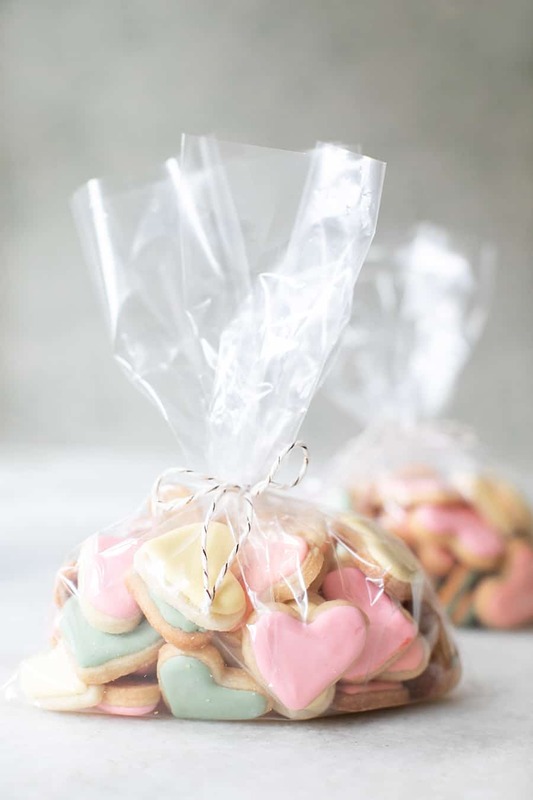 You can wrap the cookies in a little bag with ribbon and they really make the sweetest Valentine’s Day treat! 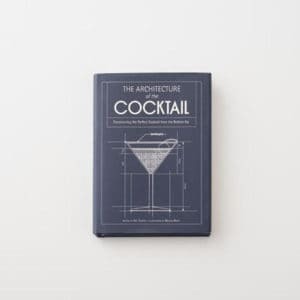 If you try these, please share with us! 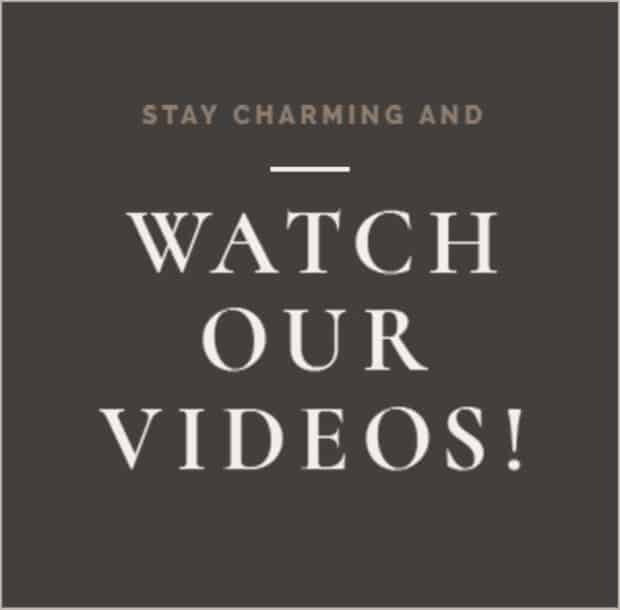 We love seeing your photos. 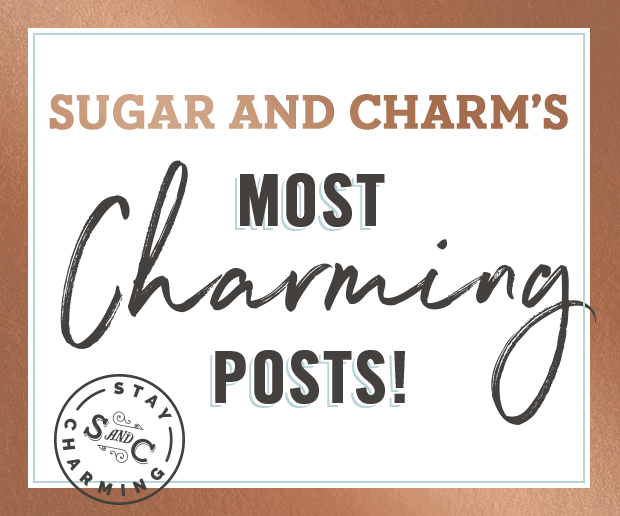 You can share on social and tag us on Facebook, Instagram or save the recipe for later on Pinterest! 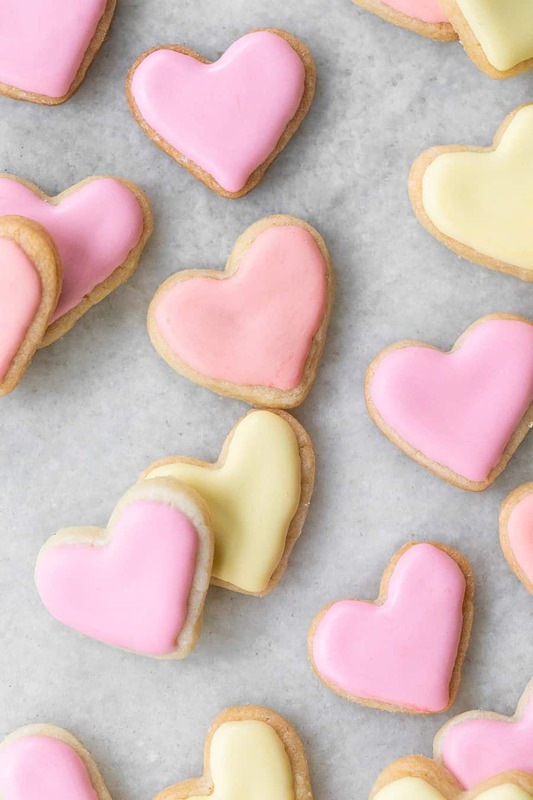 These adorable mini sugar cookies are buttery and bite size and make the sweetest treat for Valentine's Day! Remove dough from the fridge and make a space on the counter to roll it out. Use powdered sugar rather than flour when rolling the cookies so they don't stick to the surface. You can use the sugar on the top and bottom of the dough and the rolling pin. Roll to about 1/4 to 1/2" thick. 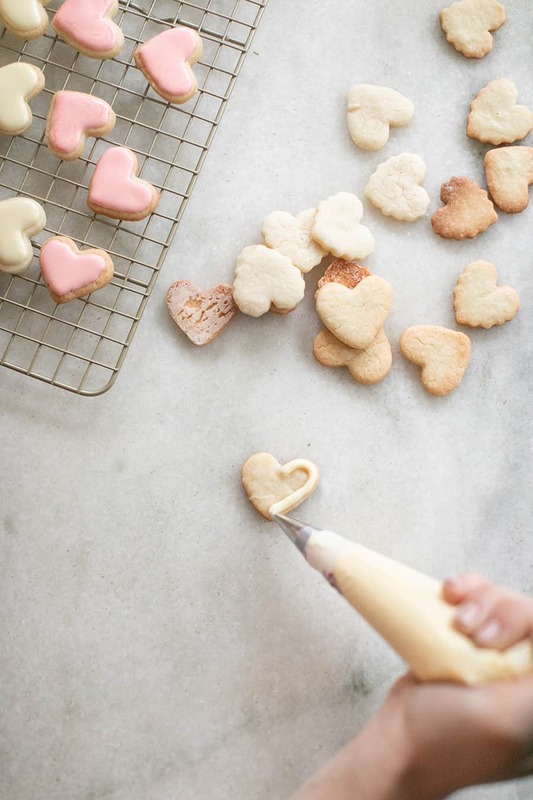 Cut out little heart shapes with a tiny 1" heart cookie cutter. 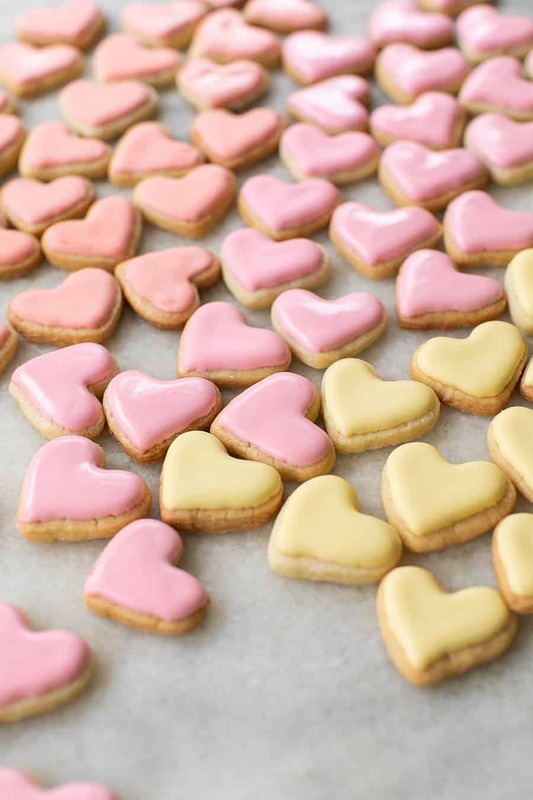 This recipe make a lot of hearts, so you'll need to bake a few batches! Place them on the cookie sheet, about 1/2" apart. Divide the frosting into separate bowls and dye as you please. The frosting dried quickly, so do not leave it out un covered. Place it in the piping bag as soon as you achieve the desired color. 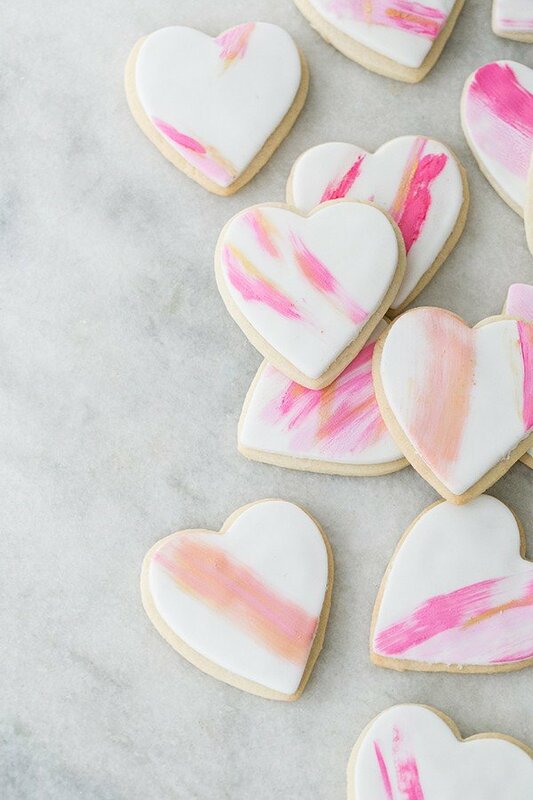 You might also love our brushstroke heart-shaped sugar cookies too! I recently made these for my daughter and her friend’s at college. They were a huge hit!!! Easy recipe and my first time with meringue icing. Your instructions were great! I did notice in the ingredients it says 1 1/2 cups of butter but listed next to that is 2 1/2 sticks. I used 3 sticks to equal 1 1/2 cups and the cookies turned out fine! The tip of using powdered sugar to roll out and cut the cookies was excellent! Thanks for a great recipe for making special treats! Oh thank you for letting us know! 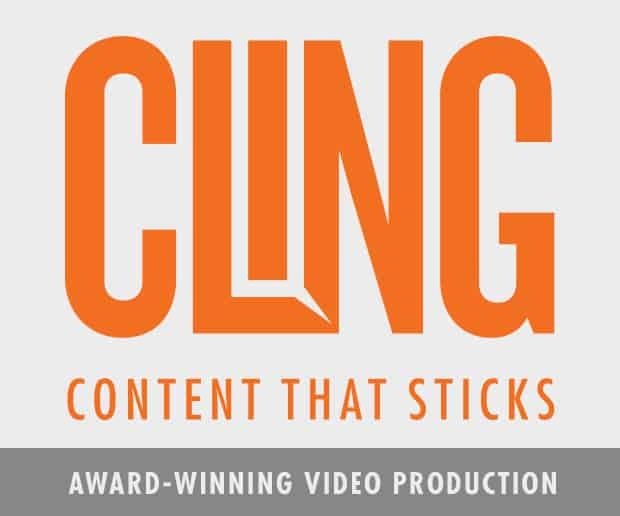 We updated it and you were right to put 3 stick in! So happy you liked them!